Here is the flag of Rawicz County in the vojvodship of Wielkopolska. On 11 Aug 2002 the County of Rawicz, obtained its own flag and Coat of Arms. Both symbols are closely related to the local traditions. The field of the Arms features the white eagle without the crown (as in the historical Arms of Wielkopolska), the bear and the gold boat. 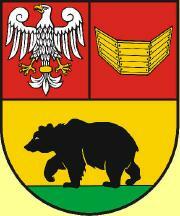 The bear is an element of the city arms of Rawicz, which were granted to the town by its founder, Adam Przyjemski, in 1638. The boat appears on the seals of two prominent and distinguished families from the area - clans of Gorek and Opalinski. The Arms are placed in the center of the flag of two, equal, horizontal stripes - yellow and red. The symbols were worked out by the specialists from the Centrum of Polish Heraldry in Warsaw."